With the winter weather in full force, the goodfirm ICBC lawyers want to draw attention to a recent case involving a dangerous stretch of highway on Vancouver Island. In Bayfield v. British Columbia (Ministry of Transportation), 2016 BCSC 1965, a plaintiff hydroplaned and hit a median. Despite going under the posted speed limit, she was still found partially responsible. Driver in BC should be warned that safe driving means more than simply obeying the posted speed limit. Many people are under the impression that abiding by the posted speed limit means they are driving in accordance with the law. However, as in the case of the plaintiff in Bayfield, that is not a correct. Section 149(1)(c) of the Motor Vehicle Act, RSBC 1996 states that a person must not drive a motor vehicle on a highway at a speed that is excessive relative to the road, traffic, visibility or weather conditions. The plaintiff was travelling south on the Inland Island Highway after a period of heavy rainfall. A logging truck in front was spraying large amounts water from the road onto the plaintiff’s car and she changed lanes to overtake it. The plaintiff hydroplaned, hit the median and rolled over coming to rest in the north bound lane. At trial, the plaintiff plead that the Ministry of Highway’s construction of the highway was not sufficient, that the highway suffered from drainage difficulty and that the speed limit was unusually high. Emails disclosed at trial indicated that the province was aware that the area had a significant number of hydroplaning accidents: over 173 in 3 years. Additionally, the highway median was found not to be consistent with the proper design and construction practices when it was built. Despite the fact that the plaintiff was travelling 10km/hr under the speed limit at the time, Mr. Justice Affleck found that the plaintiff was travelling too fast given the road conditions. 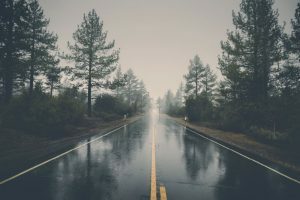 He reviewed the law around section 149(1)(c) and found that a reasonable driver would not assume the posted speed limit was a safe speed to travel given that there was a large amount of rain and water on the highways. He also found that the construction of the median had caused significant swampy conditions which further caused the car to roll. The rollover which caused the plaintiff’s injuries was found to be the fault of a combination of the overly steep slope and poor drainage of the median, and the plaintiff’s excessive speed. Mr. Justice Affleck found the plaintiff 1/3 liable for the accident and her injuries.